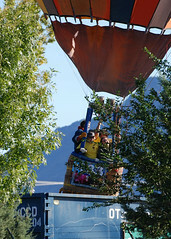 I have always wanted to go to the Albuquerque International Balloon Fiesta. In fact, it has been on my list at 43things.com for over 5 years. Then, my dear friend and colleague, Sharron Rush, asked me to speak at the Southwest Conference on Disabilities (which just happens to occur in Albuquerque during the International Balloon Fiesta). I could hardly contain my excitement, as I planned my trip. 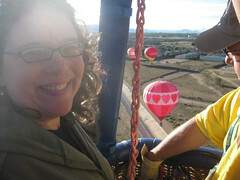 I had originally hoped to take a hot air balloon ride with my husband. But at $400 a head, the price seemed too steep (especially when I checked prices locally). My friends told me that just being at the festival was amazing, so I decided to just enjoy the balloons from the ground. The weather had been very rainy and the balloons had not been able to fly for days. Friday evening we were kickin’ around in Old Town and we met a balloon pilot (Paul) and his “new” girlfriend (Terra). Paul offered to take us up in his balloon in the morning, assuming the weather cooperated. I squealed with delight and it took all that I had not to start bouncing up and down. 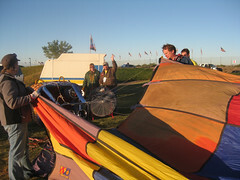 The next morning we arrived at the balloon field before sunrise and helped crew Paul’s balloon, Str-8-Up. The weather was still questionable and Paul made no promises that we would get to go up, but he did decide to at least stand-up the balloon. We helped unroll the envelope from the storage bag and hold it open while the big fan filled it with air. Being a part of the crew as the balloon inflated was priceless. Paul had been given approval by the zebra (launch director) to take-off at his own discretion. It was the final Saturday of the Balloon Fiesta and the last day for Mass Ascension. Paul’s balloon is twice as large as the average balloons and more difficult to manage. He had been carefully watching other balloons that were already up and decided he was ready for launch. Scott and I climbed in, but Paul’s girlfriend, Terra, had said she was afraid of heights and wouldn’t go with us. I looked her straight in the eye and said, “Girl, get in this balloon with me. I’m afraid of heights too.” She climbed in and we lifted off so gently it was like floating on air. As Paul began to look for a good place to land, he realized we were headed for sacred Indian ground. Our ballon was descending rather quickly and Paul had to use all his skills to get us up in a different wind current to carry us away. We were still rather low and the next place to land was a cemetery. Paul was talking to his chase crew on the radio to determine if the cemetery was a “red zone” (designated off-limits for landings). Suddenly Scott told me to turn around and look…because Paul was purposely grazing us through the top of a tree. Right ahead was a parking lot that looked perfect for landing. Our chase crew had just pulled in and Paul was bringing us down gently….gently into a dumpster! You see, Paul is an excellent pilot and a bit of a prankster. He thought it would be funny to drop us a few inches into the dumpster and make Terra and I squeal (which we did) and then expertly lift us out of the dumpster for a marshmallow soft landing in the parking lot. I’ve never laughed so hard. As we were packing up the balloon, a gentleman approached us and asked for our email addresses so he could send us pictures of our landing. So not only do we have the priceless memory of Paul’s “Trash and Dash”…but we even have pictures to prove it. 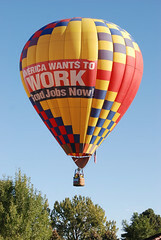 Without a doubt, I consider myself very lucky to have my dreams of the Albuquerque Hot Air Balloon Fiesta come true. Cindy, finding you and Matt (via foursquare) at the Fiesta was indeed magical. I’ll never forget our awesome double-date at the Balloon Glow and having the chance to take our very first balloon rides with the same pilot. Life is good. Yeah…oh, so very good. oz: the blog of glenda sims ( the goodwitch) is powered by	WordPress 4.8.9 and delivered to you in 0.271 seconds using 24 queries.